Lonely Planet will get you to the heart of Fiji, with amazing travel experiences and the best planning advice. Lonely Planet Fiji is your passport to the most relevant, up-to-date advice on what to see and skip, and what hidden discoveries await you. Say bula to the locals at a dance ceremony; trek to hidden waterfalls on 'Garden Island' Taveuni or ride a bamboo raft through the Namosi Highlands; all with your trusted travel companion. Inside Lonely Planet Fiji: Colour maps and images throughout. Highlights and itineraries help you tailor your trip to your personal needs and interests. Insider tips to save time and money and get around like a local, avoiding crowds and trouble spots. Essential info at your fingertips - hours of operation, phone numbers, websites, transit tips, prices. Honest reviews for all budgets - eating, sleeping, sight-seeing, going out and shopping. Cultural insights give you a richer, more rewarding travel experience - history, environment, culture, traditional lifestyles. Over 35 maps. Covers: Nadi, Suva, Viti Levu, Mamanuca Islands, Yasawa Islands, Ovalau, Lomaiviti Islands, Vanua Levu, Taveuni, Kadavu Islands, Lau Islands, Moala Islands. The Rough Guide to Fiji explores all the best to see and do in this Pacific paradise. Discover the aqua blue lagoons with exquisite beaches and the lush tropical rainforest with the most comprehensive guide on the market. With detailed information on all of Fiji's popular tourist islands and towns, this guide features full colour sections on diving and snorkelling Fiji's reefs, and tips for visiting traditional villages, plus 52 detailed maps, covering all regions and towns. There are full-restaurant and accommodation listings and Fiji's best attractions, from the backpacker looking to party, to the honeymooners looking for a secluded beach. A South Pacific expert and veteran travel writer, David Stanley knows the best way to experience Fiji from making waves at one of the world's premiere diving spots to getting away from it all in lesser-known villages. David provides great trip ideas such as Best of Fiji, Island-Hopping, and Diving in Fiji. Packed with information on dining, transportation, and accommodations, Moon Fiji has lots of options for a range of travel budgets, plus recommendations for must-see sights and regional, area, and city-centered maps. Complete with details on the best beaches and tips on prolonging a trip to the islands, Moon Fiji gives travelers the tools they need to create a more personal and memorable experience. Lonely Planet South Pacific is your passport to the most relevant, up-to-date advice on what to see and skip, and what hidden discoveries await you. Laze on New Caledonia’s white sand beaches; learn traditional dance in Tahiti or hike through Fiji’s ‘Garden Island’, all with your trusted travel companion. Inside Lonely Planet’s South Pacific Travel Guide: Colour maps and images throughout. Highlights and itineraries help you tailor your trip to your personal needs and interests. Insider tips to save time and money and get around like a local, avoiding crowds and trouble spots. Essential info at your fingertips - hours of operation, phone numbers, websites, transit tips, prices. Honest reviews for all budgets - eating, sleeping, sight-seeing, going out and shopping. Cultural insights give you a richer, more rewarding travel experience - history, environmental issues, culture, arts, cuisine, health, language. Over 110 colour maps. Covers: Easter Island, Fiji, Rarotonga, the Cook Islands, Samoa, American Samoa, the Solomon Islands, Tahiti, French Polynesia, Tonga, and Vanuatu. While most Fiji locals can speak English, it's not their mother tongue. Learning the Fijian language means you can get away from the tourist areas and out into the real Fiji - where a little bit of local talk goes a long way. 2000-word dictionary. Guide to grammar and phrase-building. Fail-safe small talk. Practicalities - how to book a room or a plane ticket. A superb travel guide in the form of a map. 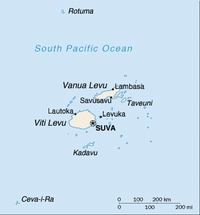 This detailed map highlights all the larger Fiji Islands plus inset maps of Lautoka, Nadi, Suva and Sigatoka. Almost an entire side of this map is devoted to providing information on Fiji, its scenic attractions, points of interest, tourist resorts, and facilities available.